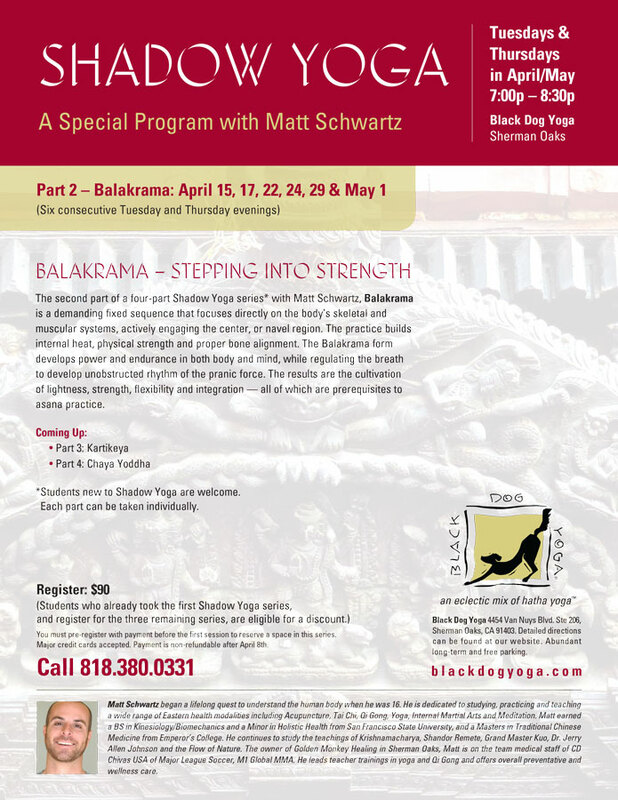 Developed by Natanaga Zhander, Shadow Yoga is a modern school of yoga that is rooted in classical hatha yoga. Emphasis is placed on four prelude forms which prepare the student for the classical asanas. Reflecting common principles found in yoga, Indian cultural dance, martial arts, and the Ayurvedic and Siddha systems on medicine, the Shadow forms combine leg work and skillful arm movements with deep breath work to strengthen and free the energy of the periphery channels. This energy can then feed into and increases the central life force. All Shadow Yoga classes are held on workshop/immersion basis. Please check back for updates or email with any questions. According to the hatha yoga text, the body is composed of sheaths or shadows that are usually frozen in behavioral and energetic patterns. The practice of shadow yoga has evolved in order to dissolve these blockages, bringing light to the places that were once filled with dark. the disciplines which join the individual soul to the universal soul or cosmic consciousness.